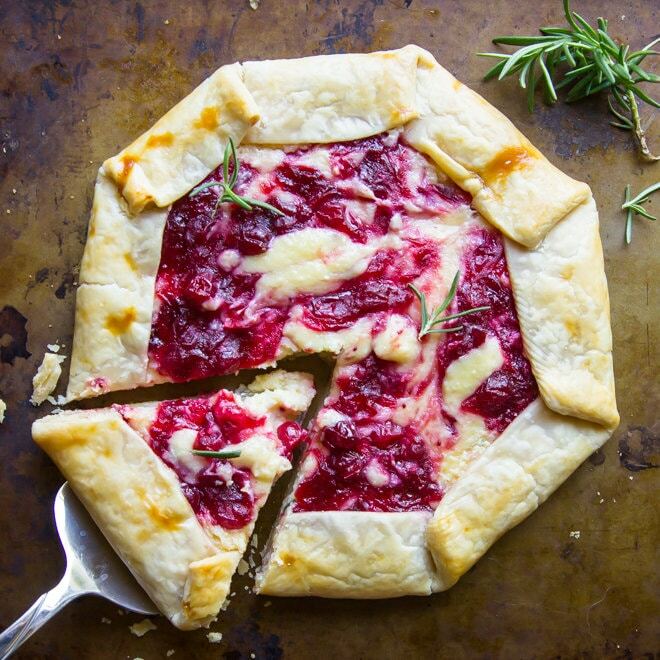 This Cranberry Cheesecake Galette is an easy free-form tart (from store-bought pie crust!) filled with fresh cranberry sauce and a rich, cheesecake filling! I crave cranberry sauce all year round. I keep bags in my freezer so I can make cranberry sauce in July, if I want to (you can freeze them in their original packaging for up to one year), and once they show up on shelves in the fall, I can’t be stopped. In the past couple of weeks alone I’ve made Cranberry Cream Cheese danishes, these Harvest Roasted Vegetables with cranberries, and my favorite Cranberry Sauce with Apples, just because. 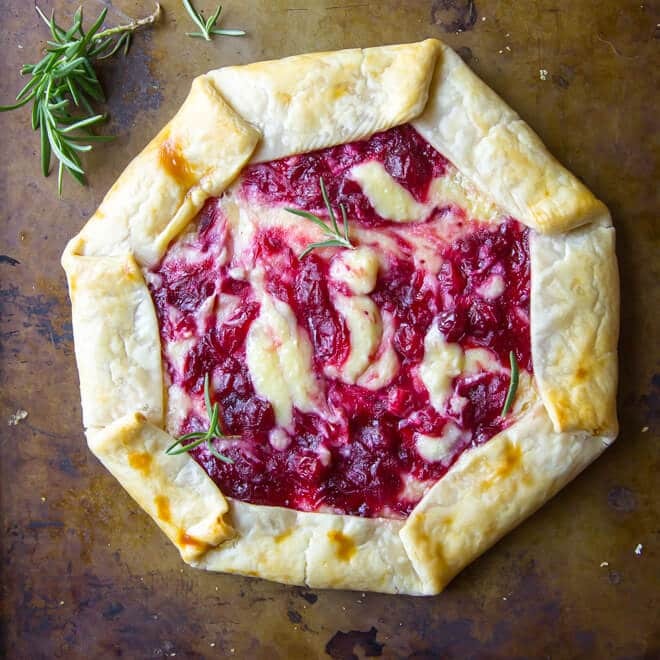 Now that you can enjoy cranberries with breakfast, lunch, and dinner, let this Cranberry Cheesecake Galette steal the show for dessert! 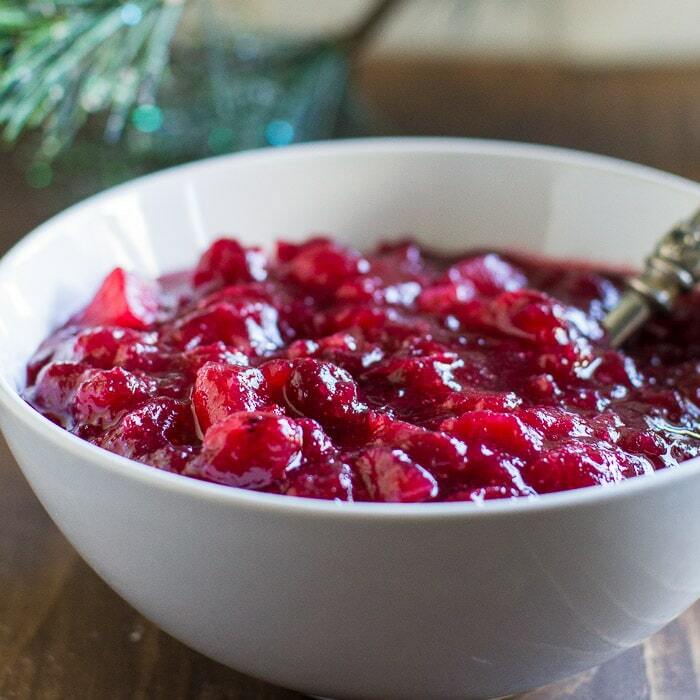 Start by making a super simple Cranberry Sauce. I added some fresh rosemary for some extra fall flavor, but you can leave it out if you want to. You can make the cranberry sauce up to 4 days in advance; just cover it and keep it in the refrigerator. Fresh cranberries are a versatile fruit that offer big health benefits in a little package. They contain unique polyphenols not commonly found in other fruits. While the cranberry sauce cools, mix up the delicious cheesecake filling. It’s just 4 ingredients! Spread the cheesecake filling on the pie crusts (let’s keep it simple with store-bought!). Then, drop dollops of cranberry sauce and swirl with a knife. 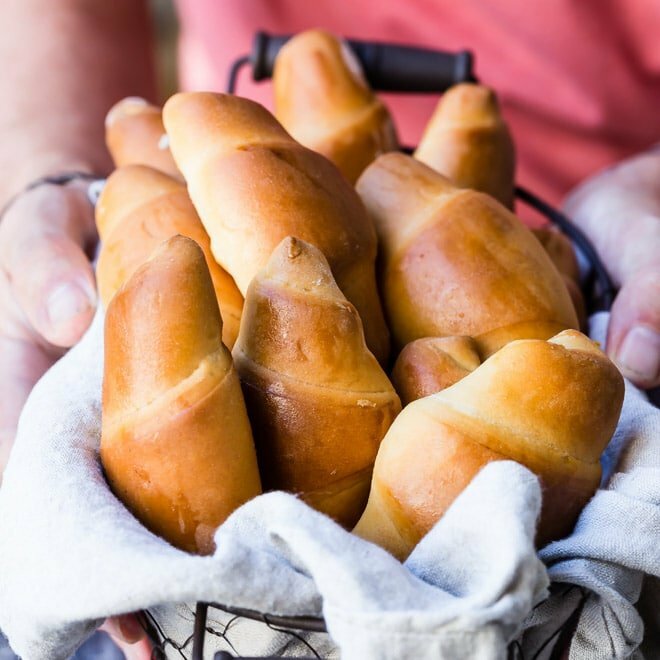 Fold the crust over in 2-inch sections. I cannot pleat a pie crust to save my life, but this was easy. Just make one fold and keep folding. And it’s supposed to look rustic! Then, brush with a bit of egg wash and bake. That’s it! Are you part of the crowd that celebrates Friendsgiving? With all my family back in the Midwest, my husband and I have started getting together with friends on Thanksgiving. This year, we are going all out and getting a cabin in Lake Tahoe with my friend Sarah and her family. It’s going to be epic. And not just because of this galette, although it will certainly be on the menu! 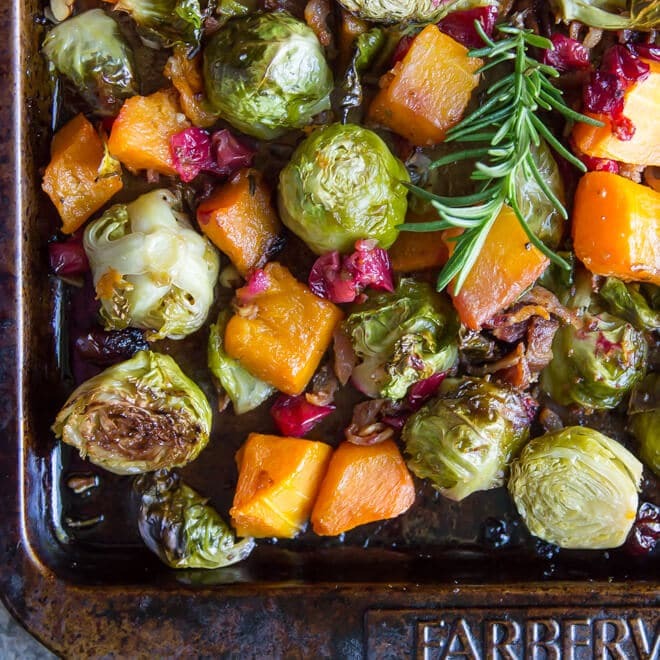 Hosting a Friendsgiving celebration of your own? Snap a picture of your Friendsgiving cranberry creations and post it on Facebook, Instagram, Twitter, or Pinterest using the hashtag #FriendsgivingCranberryContest and upload it to CranberryFriendsgiving.com for a chance to win one of eight $500 prizes! For more information and contest rules, visit CranberryFriendsgiving.com. 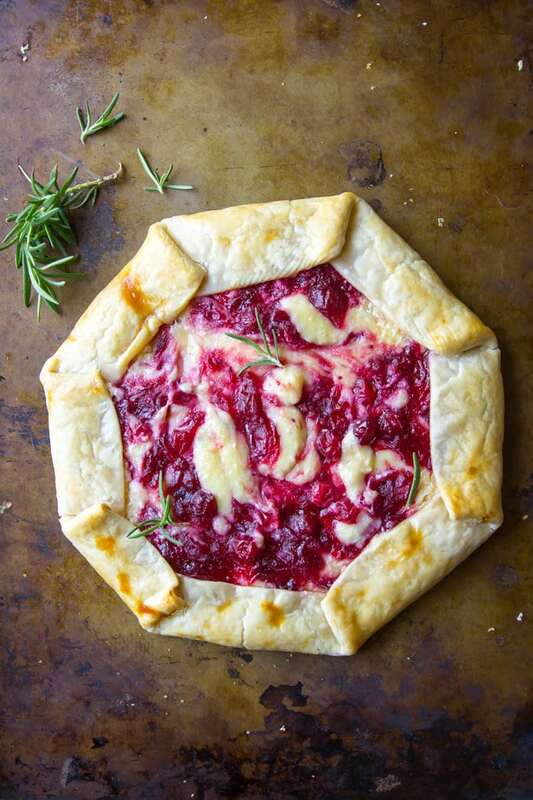 Save this Cranberry Cheesecake Galette to your “Desserts” Pinterest board! In small saucepan, combine sugar, water, and salt. Bring to boil. Stir in cranberries and rosemary. Cook until cranberries have popped and broken down and the sauce has thickened, about 10 minutes. Cool at least 30 minutes. Meanwhile, preheat oven to 400 degrees. Line baking sheets with parchment paper. Unroll both pie crusts into a flat circle and lay on prepared sheets. Separate egg whites from egg yolks and set whites aside. In a standing mixer with the paddle attachment, or in a bowl with a hand mixer, whip cream cheese, sugar, yolks, and vanilla until smooth. Divide cream cheese filling between the center of both pie crusts, leaving a 1-inch border around the outside. 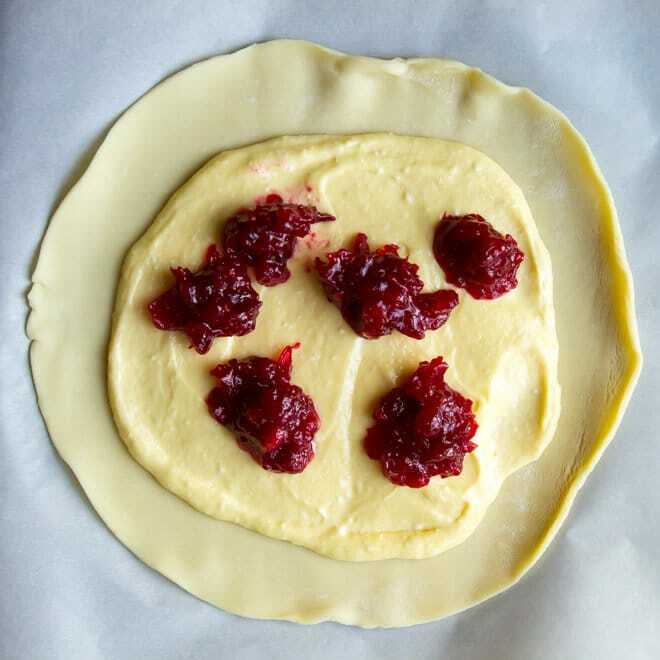 Drop spoonfuls of cranberry sauce on each, using about 1/2 cup cranberry sauce per galette. Gently Drag knife through cranberry sauce to create a swirl pattern. Use a light touch and be careful not to over-swirl the filling. Fold 2-inch segments of pie crust up at a time to create crust. You should have about 8 folds per galette. In a small bowl, whisk together egg whites and cream or water. Brush on folded galette crust. Bake until crust is golden brown and filling is heated through, about 15 to 20 minutes. Remove from oven and cut each tart into 6 wedges. The cranberry sauce can be made, cooled, and stored in the refrigerator up to 4 days in advance. Be sure to connect with the Cranberry Marketing Committee on Facebook, Twitter, Instagram, Pinterest, and YouTube for even more great recipes and inspiration! So rustically elegant :D Great touch with adding the rosemary in the cranberry sauce. I think that’ll be a game changer this year! Every year I feel a bit envious of your Thanksgiving celebrations over there. Such a nice holiday! And even nicer with desserts like this to enjoy. I’ve seen plenty of galettes but never with a cheesecake filling. Delicious! And of course this would be great for Christmas too, with the cranberry ‘theme’ going on! That sounds like the perfect touch Brigette, thanks for the tip! And for trying the recipe of course. :) Homemade pie dough would definitely be a step up, too. 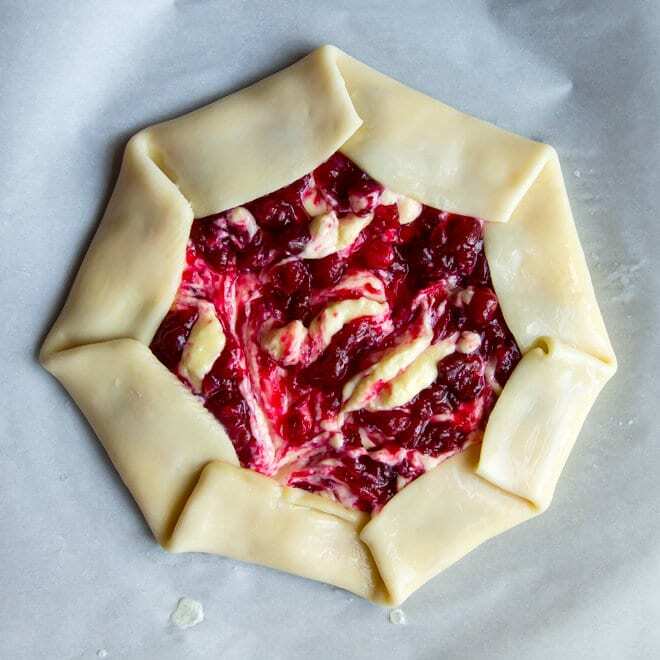 Where might I find the recipe for the Cranberry Cream Cheese Danish? I clicked on the link and it sent me to a pic but there was no recipe. Hi Jen, I’m so sorry about that. I never ended up posting the Cranberry Cream Cheese Danish, so it’s really sad that I linked to it! I will see if I can track down the recipe (I made it, photographed it, but never posted it) and I’ll send it to your email address. Sorry about that. Thanks! Yummy recipes..glad I came upon them. Can you bake this at 350°F? I have another dish that needs to bake at the same time and that is at 350. Need to bake both so I can jump in the car and head to a potluck after. Thank you!